From ancient times throughout history to modern-day society, a baby shower has served as both celebration of new life and rite of passage for new mothers and mothers-to-be. While baby showers of Ancient Egypt and Ancient Greece may hold little resemblance to today’s gift-giving gatherings, these events of early history nonetheless served a similar purpose: to welcome new life into the world. For the most part, though, ritual was the central focus in those days, and not gift-giving. In many parts of the world today, this remains the case. But baby showers in the U.S. have long been centered on showering the expectant mother with, from group purchases of extravagant strollers and the latest nursery furniture to everyday diaper supplies. 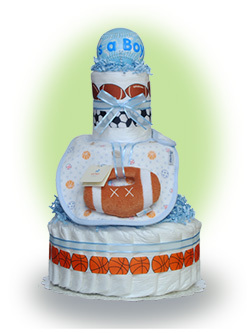 At Lil’ Baby Cakes, we continue to see interest in one of the most popular decoration-gift combinations at baby showers today– the baby diaper cake. For readers not familiar with baby diaper cakes, we take diapers and other common baby care items and arrange them to look like the layers of a tiered cake. Modern day baby showers in the U.S. really came into their own after World War II, coinciding with the start of the Baby Boomer era. Baby showers continued to evolve through the years, each passing decade leaving its personal mark of consumer ideology. Today’s baby shower ritualof showering the mother-to-be with gifts is seen as a way to lighten the financial burden of caring for an infant, as well as an expression of well wishes. You may be surprised to learn, however, just how large of an impact baby showers have on today’s economy. With 4 million babies born in the U.S. each year, and the average amount spent on each baby shower itself ranging from $200 to $1,000, the potential contribution to the American economy is sizable. The U.S. ranks third worldwide for amount spent on baby showers per capita, behind heavily populated China and India. Indonesia and Brazil round out the top five. The average amount spent on a baby shower gift in the U.S. is $30, more than the $20 average spent for birthday gifts, but less than the $50 average spent on wedding gifts. While some contemporary baby showers are built around a theme of pampering the new mother, baby shower gifts have traditionally been focused on the baby and its care. The top five most popular baby shower gifts in the U.S. are: 1) booties; 2) picture frames; 3) Sophie the Giraffe (teething toy); 4) sleep sacks; and 5) onesies. Mothers-to-be may be honored with multiple baby showers in today’s society, such as a baby shower thrown by co-workers and another thrown by family and non-work friends. Since gift giving is the central focus of baby showers, etiquette holds that someone other than a family member holds the celebration. However, it is becoming less uncommon for a close family member, such as the soon-to-be grandmother, to host the event. While the majority of baby showers held today are ladies-only events, baby showers taking the form of cocktail parties honoring both parents-to-be are becoming more popular. From the post-birth rituals of early history to today’s baby showers bursting with modern consumerism, cultures throughout the ages have used baby showers as rites of passage for new mothers and their babies. This week, StartupNation formally announced the winners in their 2009 Leading Moms in Business Competition. I’m happy to report that Lil’ Baby Cakes finished 69th out of 200. I’m really honored by our placement and want to thank all my customers, friends, and family members who voted for me. I’m also grateful to StartupNation and VerticalResponse for sponsoring a contest specific for mom owned businesses. It’s great to be recognized as a mom who owns her own business and obviously also manages life at home. Lastly, there are also some great people behind the scenes who work with me every day on our diaper cake line. These ladies are truly dedicated to making quality products one by one with the attention to detail our customers demand. They too share in this award with me.